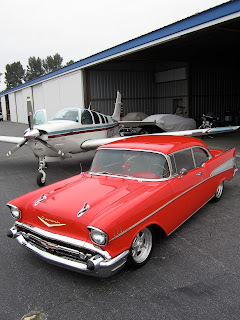 The Father's Day edition of the California Car Cover catalog the cars and airplane of our good friend and customer Leon Kaplan. You might recognize Leon as The Motorman. 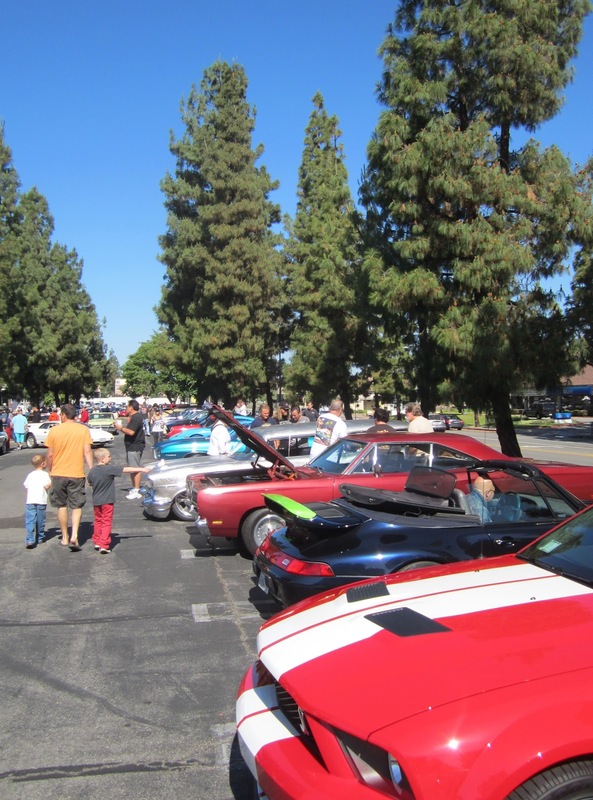 Leon host a Sunday morning automotive talk radio show on KABC radio. Leon and my father, Jim, have been friends for many years. 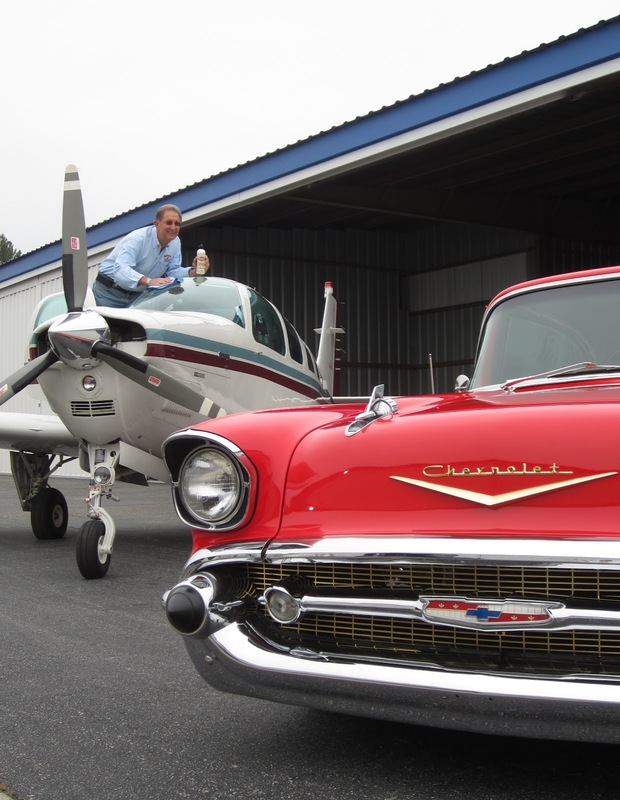 Every once in a while we will go on-air with Leon to talk hot rods and race cars. 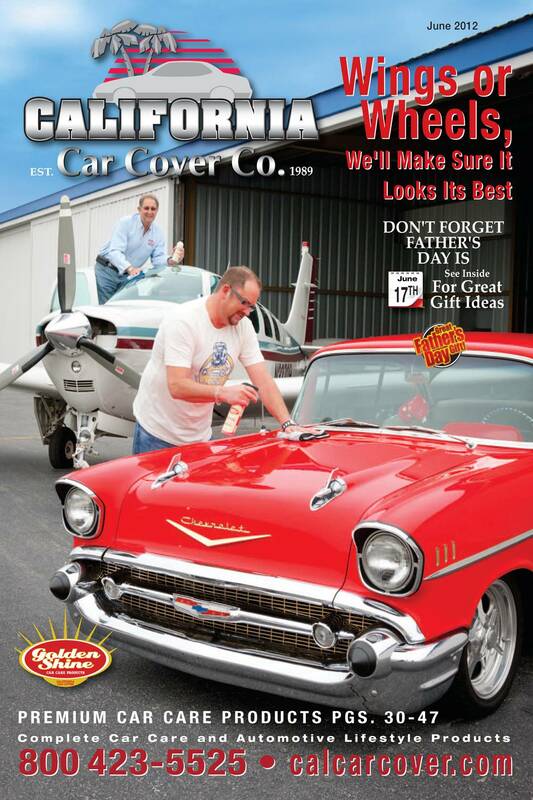 We were thrilled that Leon and Lance would take time out of their weekend to participate in the Father's Day cover. 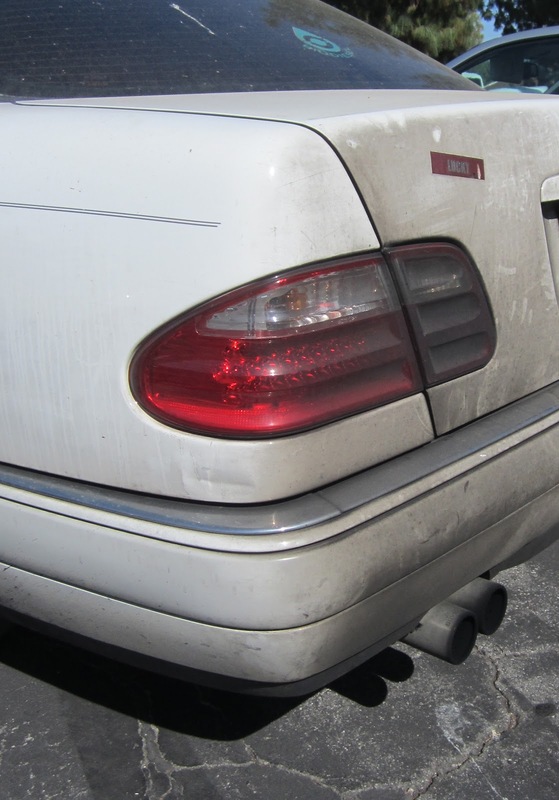 The father and son team also own and operate Lancer Automotive, an auto repair shop in Los Angeles. We met them out at the hangar to take some photos of Leon's red 1957 Chevy and airplane. Leon and Lance are fans of anything with engines. We thought it would be a unique cover shot to show our friends and customers that our products can keep any machine looking its best. Leon does use our Golden Shine Products on his 1957 Chevy, Mustang, Harley and airplane. 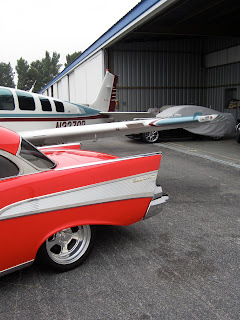 1957 Chevy, Mustang GT and the Bonanza. Here I am in the airplane. I told Leon that I have seen Top Gun quite a few times, so I am practically a pilot. 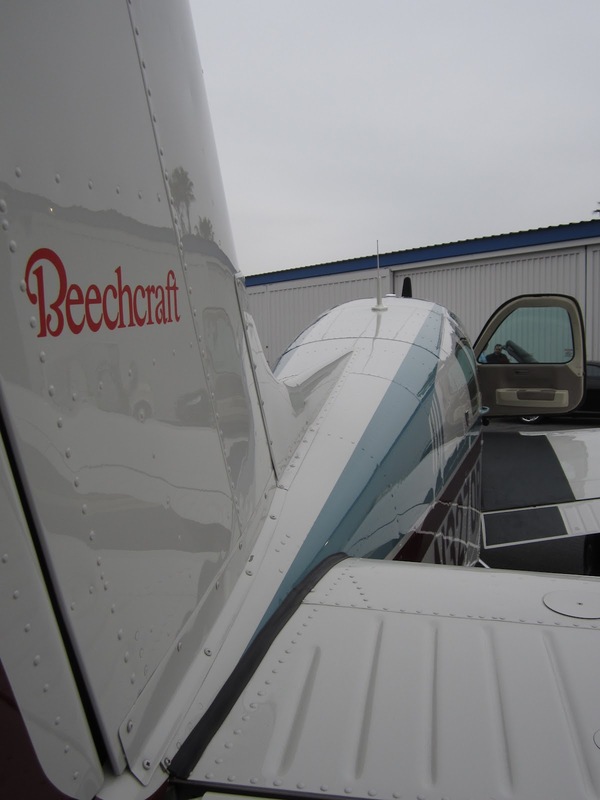 I asked him if I could take the plane out for a flight and he quickly declined. When not being driven, the Mustang and El Camino are kept clean under Plushweave California Car Covers. 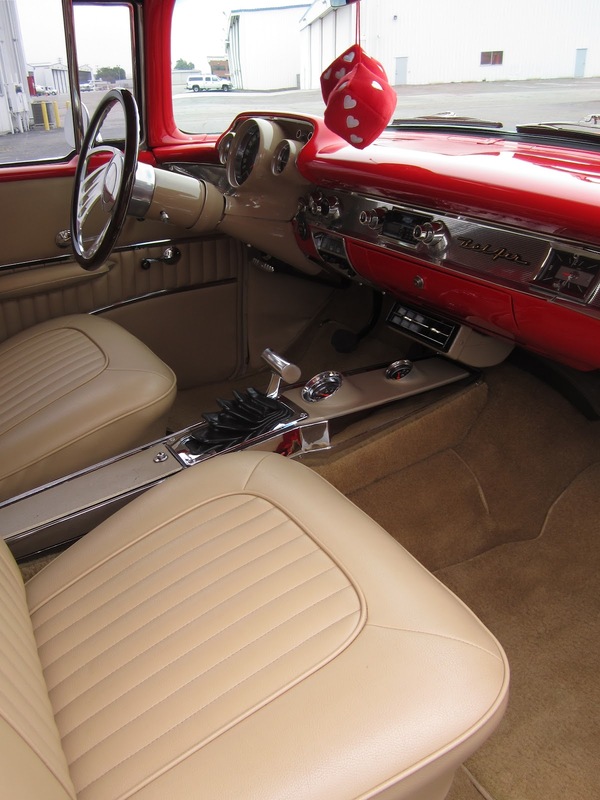 Leon's 1957 Chevy Bel-Air with billet wheels and custom leather interior. 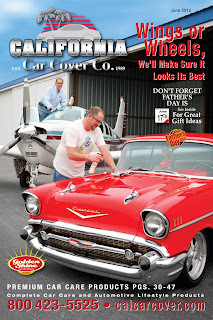 Below is the Father's Day 2012 California Car Cover catalog cover. Thanks again to Leon and Lance Kaplan for participating in the cover shoot. If you do not receive our catalog in the mail you can do so on our website. 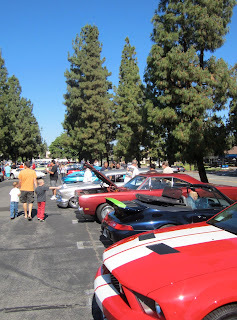 There was a lot going on in Woodland Hills, Ca this past Sunday. The last Sunday of meant that it was Supercar Sunday yet again, plus the new Topanga Vintage Market attracted a lot of people to the Westfield Promenade over the Memorial Day Weekend. The marquee vehicle for this past Sunday was Porsche. 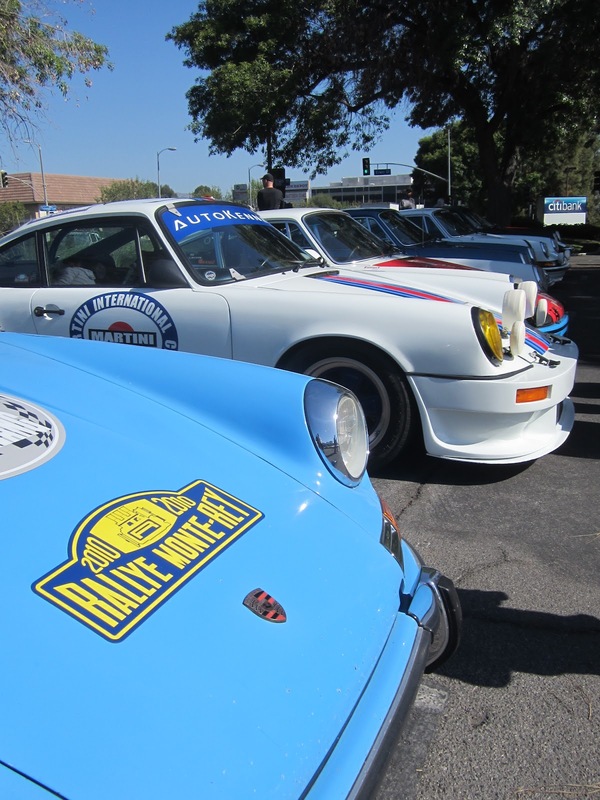 There were plenty of Porsche vehicles of all generations on display, plus there were still quite a few classic American cars on the property. There was plenty of German engineering in the parking lot this past Sunday. 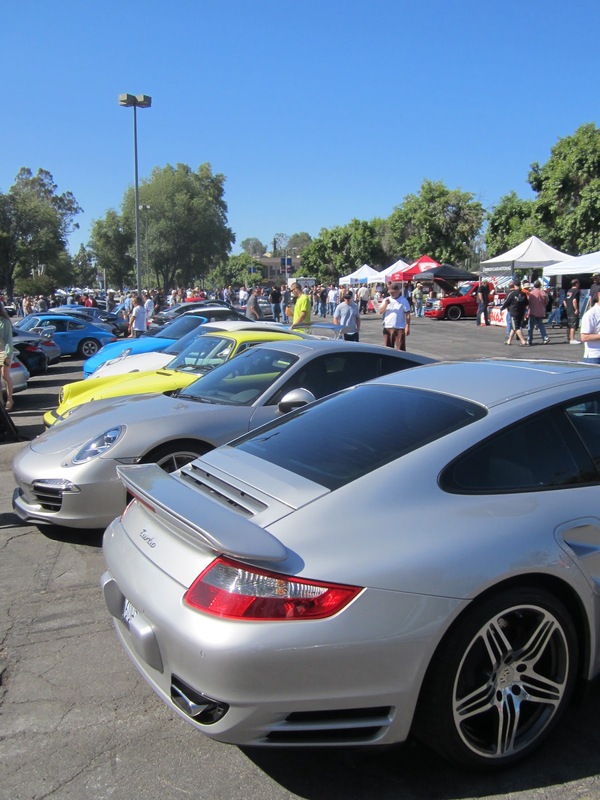 Supercar Sunday always attract a big crowd and the perfect weather over the holiday weekend brought out even more people. Though Porsche was the featured car of the day, there was still plenty of American muscle cars at the show. 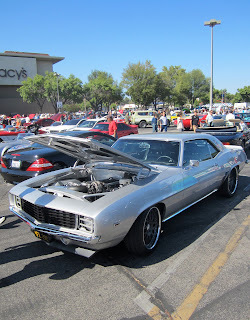 This street machine Chevy Camaro and the Chevy Corvette below were just two of them. 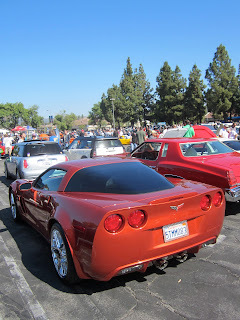 If you love Camaro vehicles, don't forget about our upcoming Camaro Car Show at California Car Cover in a few weeks. 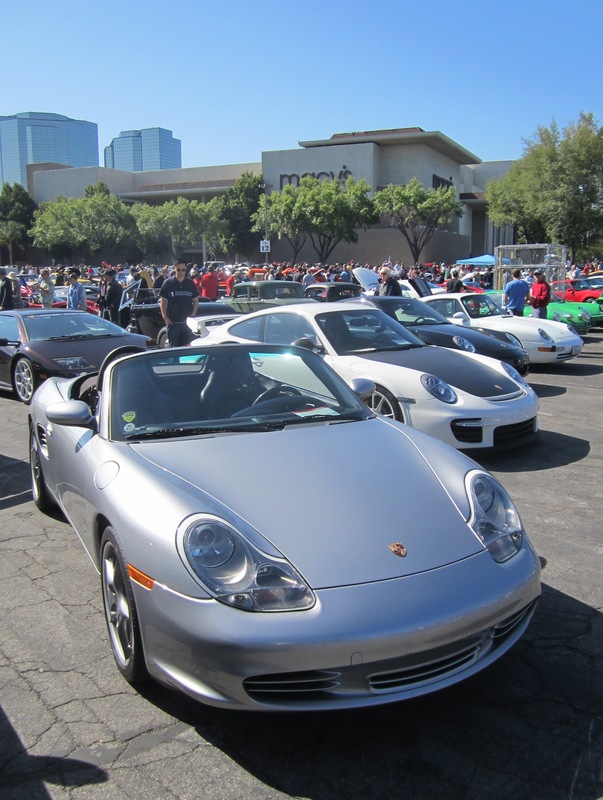 This is what draws all the people to Supercar Sunday: variety. 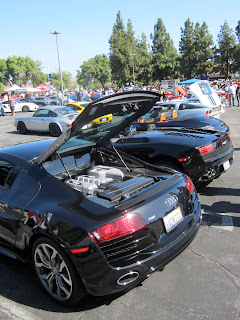 Here is an Audi R8, Lamborghini, Porsche and Corvette all in a row. 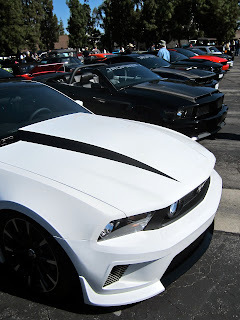 There were plenty of Ford Mustang vehicles new and old at the show. 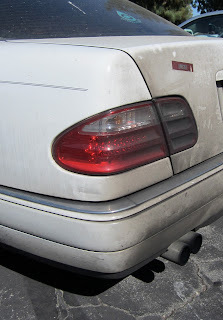 This Mercedes is definitely in need of our Golden Shine Go-To Cleaner and Quick Shine. 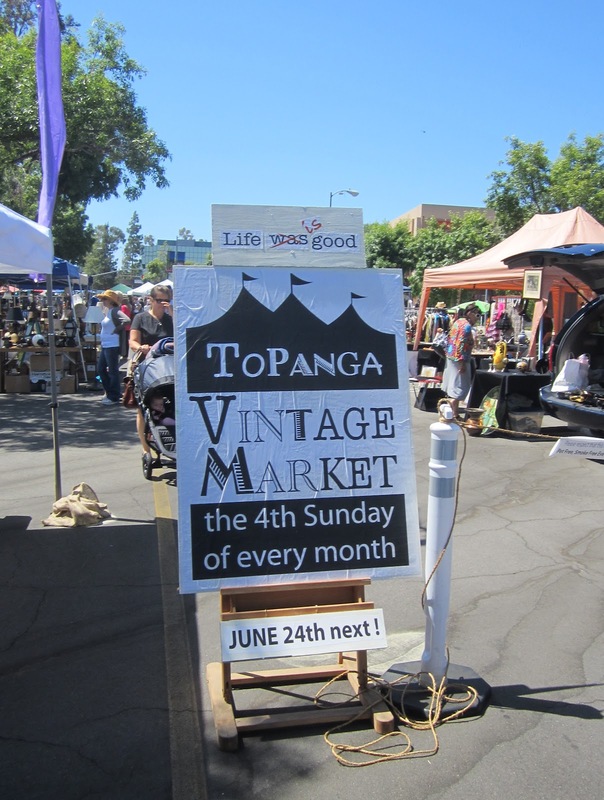 Right around the corner from Supercar Sunday is the new Topanga Vintage Market. It started up last month and definitely grew in size since the first show. The Vintage Market is like a mini Rose Bowl Swap Meet in the valley. It is a great place to pick up hard to find vintage decor, antiques and much more. I am a fan of vintage items so it was worth the walk over to see what was on display at the market this time around. 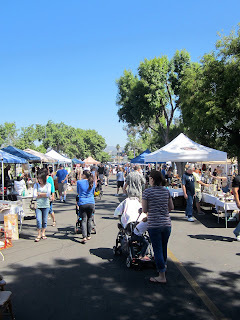 The market attracted a lot of vendors and people. 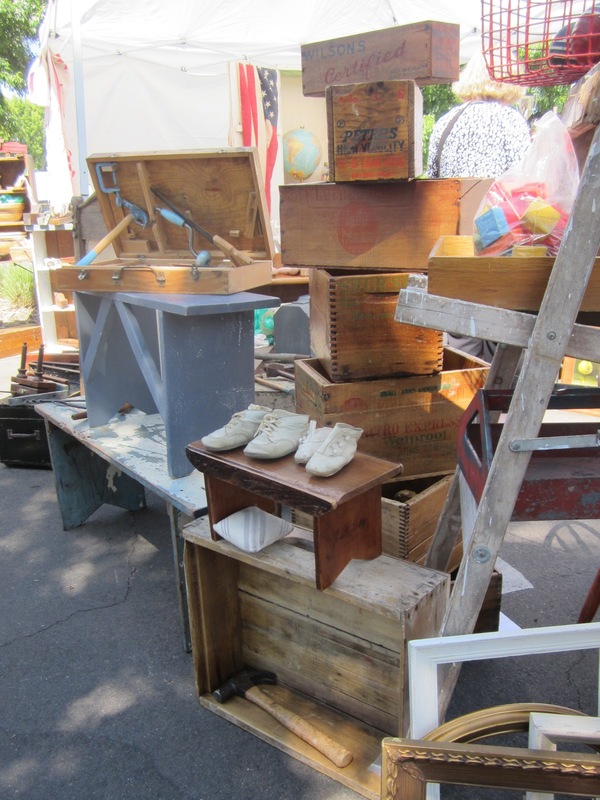 It also sounded like the next event in June is going to have even more vendors on display. The Westfield Promenade in Woodland Hills is becoming a happening place the last weekend of the month. While I was attending local car shows this past weekend, my brother, and fellow California Car Cover employee, Jimmy DeFrank, headed down to Bristol, Tennessee for the Spring Fling 20's. 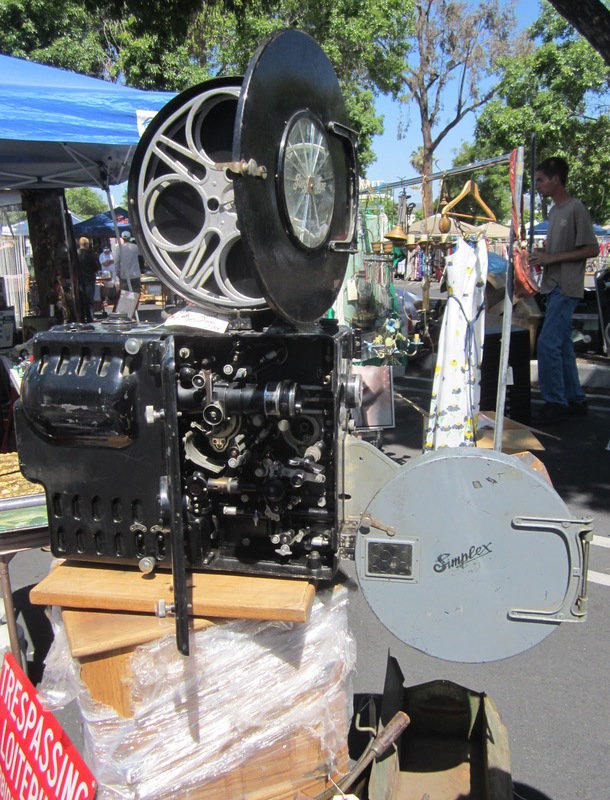 The event was put on by Peter Biondo and Kyle Siepel. 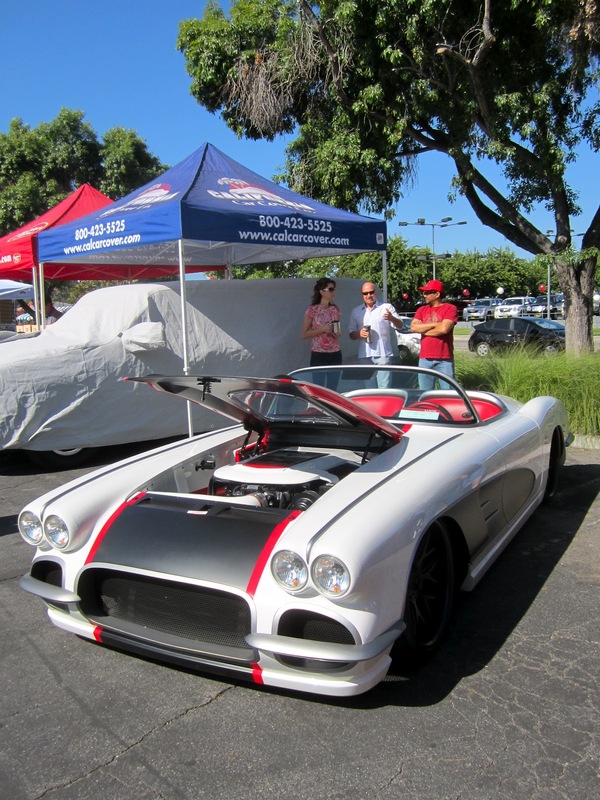 Peter and Kyle are standouts on the NHRA Lucas Oil Drag Racing Series and they have been long time friends of the DeFrank family and California Car Cover. Since Jimmy was going down there to represent California Car Cover, I told him to take his camera along and share the fun and activities at the drag strip with all of our customers. Jimmy is taking over from here. 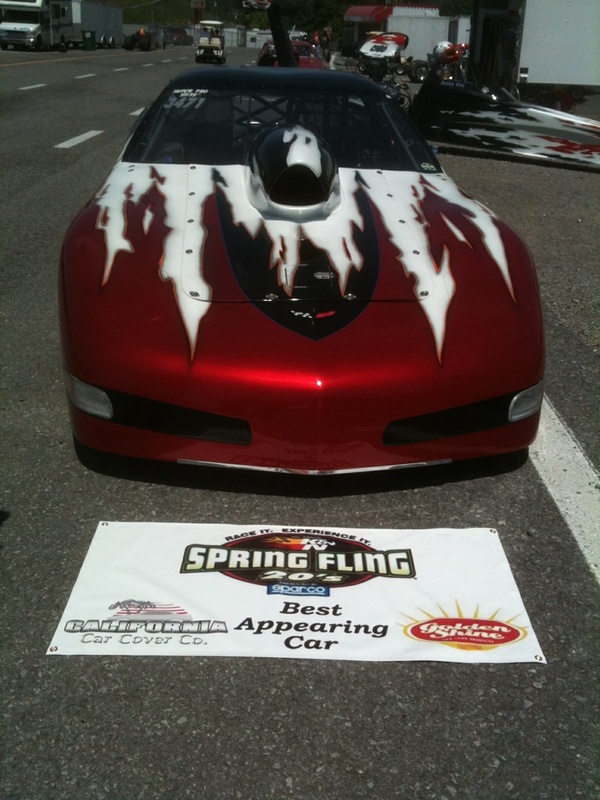 The 3rd Annual K&N Spring Fling 20's was held at Thunder Valley Raceway in Bristol, TN. It is a very nice racing facility and one of the premiere tracks on the NHRA circuit. Over 400 Sportsman bracket racers from all over the country attended the event. 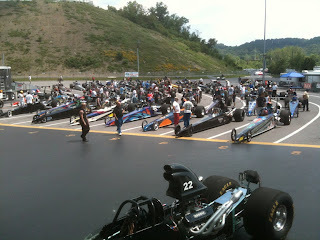 The staging lanes were filled with dragsters and crew members all weekend long. 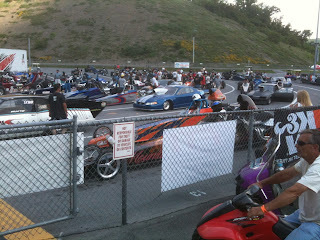 All the racers were vying for the big $20,000 payout each day. A new day, meant a new race, so every racer had a chance to win some money if they lost early on the previous day. 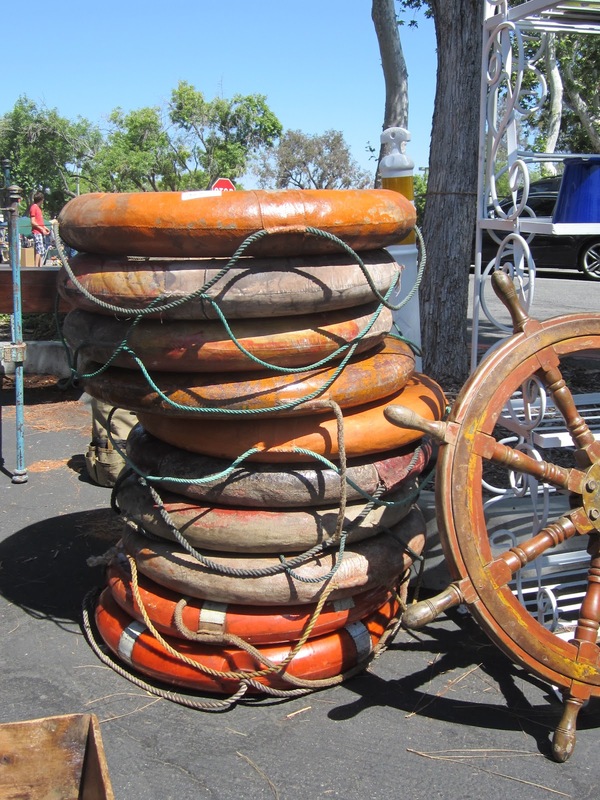 This meant long days for everyone, but well worth it if you made the money round. There was a big BBQ going on with plenty of my friends on either side of the tables. It was a great afternoon of interacting with fellow racers and bench racing. I even spent some time behind the table serving sandwiches. 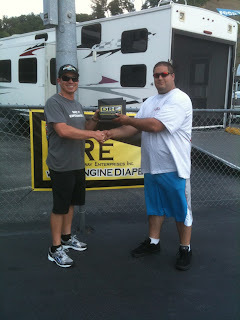 Peter and Kyle are great friends and racers, so I was happy to help out where they needed. Though there is a chance I ate a few more sandwiches than I told them at the race. It gave me a chance to show off my custom Kyle Siepel Spring Fling 20's t-shirt that I had made special for the event. Peter Biondo with a winner of one of the Giveaway Prizes at the event. The event attracted a lot of great sponsors and product donations from companies, such as Jeg's Mail Order, K&N, Sparco, Race Tech, DRE and many others. You can see more about the race at its official website. A view down Bristol Dragway. 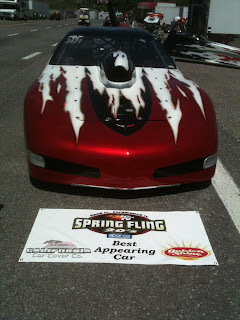 California Car Cover awarded the best appearing car award to this Chevy Corvette race car. 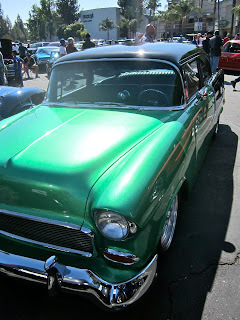 The car looked great and was well deserving of the award. 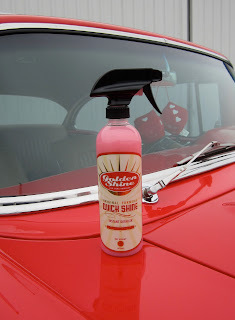 Time to make it look even better by applying some Golden Shine Car Care Products! As the sun went down, the racing kept heating up. The final round was not run until late Saturday night, but the fun kept going well after the final win light came on. Congratulations to Bob Maclosky for taking home the big money on Saturday night. It was a long, but exciting day at the race track. After the racing was done for the night there was still plenty of fun to be had. Everyone stuck around for some good times, good friends and possibly a few dance floor dance offs. For Kyle's sake those photos and videos will not be posted on our blog. It was a fun weekend and a big thank you to Kyle and Peter for inviting me out to the race. 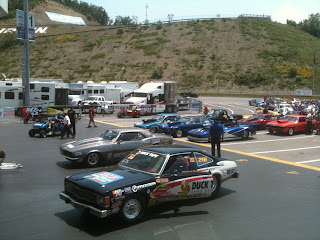 Coverage from the entire weekend can be seen at Drag Racing Online. Where will California Car Cover be next? Check it out on our website. Stay connected with California Car Cover on Facebook as well.